The number of Pakistanis reporting they are better off now has increased from 25% in 2002 to 51% in 2014, according to Pew Research Center report from its 43-nation survey on life satisfaction around the world. However, only 36% of those surveyed in Pakistan express personal optimism over the nest five years. Among Pakistan's neighbors, 44% of Indians and 34% of Bangladeshis say they are now better off. Large majorities of Bangladeshis, Thais, Indonesians, Chinese, Filipinos and Indians expect their life in five years to be higher on the ladder than it is today. Pakistanis are considerably less sanguine about the future, but many say they don’t know where they will stand in five years (32%). 1. On average, people in richer countries in America and Europe are generally happier than those in poorer, less developed countries. 2. People in emerging economies, particularly in Indonesia, China, Pakistan and Malaysia with double-digit increases, are catching up with the sense of well-being expressed in richer countries. 3. Money isn’t everything. People prioritize nonmaterial things – such as good health and a quality education for their child – as most important in life. 4. Social and political upheaval takes a heavy toll on individuals’ life satisfaction. The survey particularly cites declining life satisfaction in Egypt and Ukraine. 5. People in Asia and Africa are the most optimistic about the future – Middle Easterners are the least. There is significant data to support Pakistanis belief that they are now better off than in 2002 or 2007. GeoTV is illustrating this welcome phenomenon of upward social mobility in Pakistan with a series of motivational "Zara Sochiey" videos on young men and women who have risen from humble origins to achieve significant successes in recent years. Each individual portrayed in the series has overcome adversity and focused on acquiring education as a ticket to improve his or her economic and social situation. GeoTV videos feature a number of young men and women, including Saima Bilal, Kashif Faiq, Qaisar Abbas and many others, to inspire and encourage other Pakistanis to pursue their dreams against all odds. Contrary to the incessant talk of doom and gloom, the fact is that the level of educational attainment has been rising in recent decades. 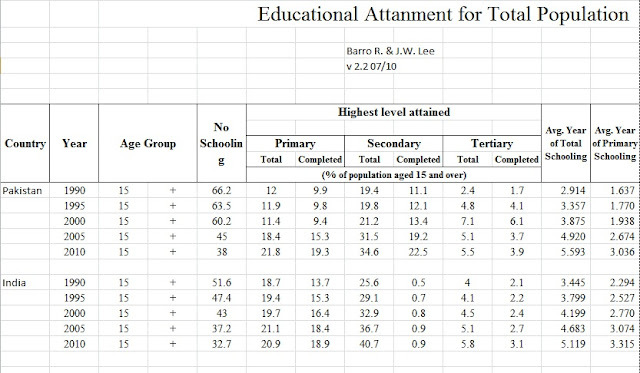 In fact, Pakistan has been increasing enrollment of students in schools at a faster rate since 1990 than India, according to data compiled and reported by Harvard University researchers Robert Barro and Jhong-Wa Lee . In 1990, there were 66.2% of Pakistanis vs 51.6% of Indians in 15+ age group who had had no schooling. 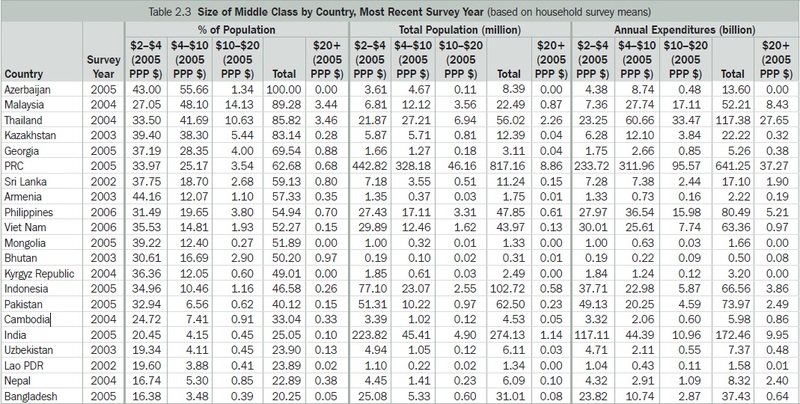 In 2000, there were 60.2% Pakistanis vs 43% Indians with no schooling. 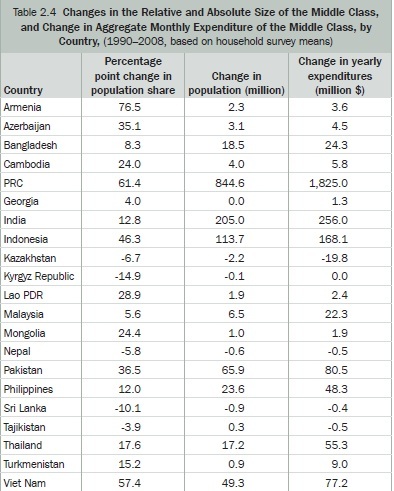 In 2010, Pakistan reduced it to 38% vs India's 32.7%. Education and development efforts are beginning to bear fruit even in remote areas of Pakistan, including Federally Administered Tribal Areas. The Guardian newspaper recently reported that FATA's Bajaur agency alone has 616 school with over 60,000 boys and girls receiving take-home rations. Two new university campuses have been approved for FATA region and thousands of kilometers of new roads are being constructed. After a recent visit to FATA, Indian journalist Hindol Sengupta wrote in The Hindu newspaper that "even Bajaur has a higher road density than India"
Prior to significant boost in public spending on education during Musharraf years, the number of private schools in Pakistan grew 10 fold from about 3000 in 1983 to over 30,000 in 2000. Primary school enrollment in 1983 has increased 937%, far greater than the 57% population increase in the last two decades. Unfortunately, there has been a decline in public spending on education since 2008, even as not-for-profit private sector organizations, mostly NGOs, have stepped up to try to fill the gap. 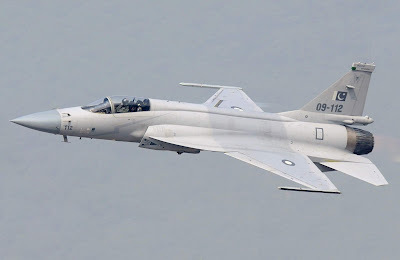 Last year, a Pakistani government commission on education found that public funding for education has been cut from 2.5% of GDP in 2007 to just 1.5% - less than the annual subsidy given to the various PSUs including PIA, the national airline that continues to sustain huge losses. Clearly, this is not the time for Pakistan's political leadership to let up on the push for universal education. The momentum that developed in Musharraf years needs to be maintained, even accelerated to get to the goal of 100% literacy and 100% enrollment of all children in Pakistan. Nothing less will do if Pakistan is to achieve economic competitiveness on the global stage. People in emerging markets are happier than they’ve been in years, according to a Pew Research Center study. That assessment comes despite the gloomy march of capital out of emerging markets and the Fed calling it quits on the easy money that’s spurred growth there. So what’s the twist? They’re richer–or at least feel that way. Richer countries, on average, report being happier, the study shows. This holds both on a national and individual level. Asians are the most optimistic of the bunch, with some of the biggest gains in perceived well-being from 2007 to 2014 in Indonesia, China, Pakistan and Malaysia. Pew conducted the survey in 43 countries by asking where people rate themselves on a “ladder of life” scale from zero to 10. While wealth isn’t the only ingredient of happiness, “material well-being” had the biggest effect on overall happiness, the report said. Other lesser factors are economic—such as job satisfaction and living standards—and personal—such as family, friends and religion. Life satisfaction also rose in countries with higher GDP growth during the study’s seven-year span. Malaysia, which had one of the fastest growth rates since 2007, boasted some of biggest leaps in life satisfaction, according to the report. This is nowhere more evident than in China, where GDP grew by an average of 10% and the rate of increase in life satisfaction from 2007 to 2014 was one of the fastest among emerging markets. 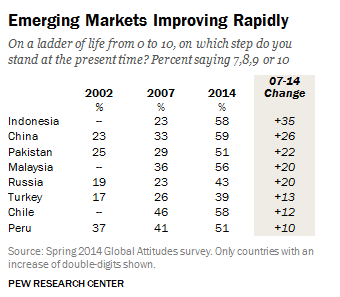 The study also shows that well-being in emerging markets now rivals that of advanced economies. Encouragingly, the happiness convergence isn’t because people in richer countries are less satisfied. Rather, personal well-being held steady in most wealthy nations from 2007 to 2014. Israel, the U.S., Germany and the U.K. top the happiness charts among advanced economies. Middle Easterners were the least optimistic when asked about the next five years, with Egypt and Jordan showing the largest dip in satisfaction since 2007, which the report pins on social and political unrest. Still, “the richer, the happier” correlation holds only up to a point: The perk of wealth tends to taper among richer nations, suggesting that climbing incomes move the needle less at the outer boundary.